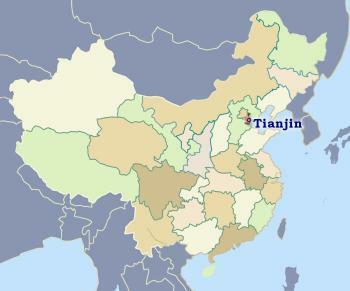 Tianjin is the industrial and transport hub for Beijing and northern China. Sometimes you will still see it written as Tientsin WG following the older spelling. Its position as one of the five metropolitan provinces of China reflects its role as a city of importance for many centuries. Its cosmopolitan feel has led it to be dubbed the ‘Shanghai of the North’. It is famous for its seafood cuisine. Tianjin Train station. November 2012. Tianjin is a bustling city rivaling Shanghai and Beijing for the range of industries, shops, museums and cuisine available. The modern city is centered on these foreign concessions which have been restored while much of the old Chinese city has been replaced with modern buildings. Part of the old area is called The Five Avenues ➚ 五大道 Wudadao. The distinctive architecture of old foreign concession buildings can be seen there and the nationality of the original concessions is embodied in the style of the houses. Reflecting its colonial past there are two large cathedrals: Wang Hai Lou (north) and Xi Kai Jiao Tang (south). Of the older Chinese buildings in Tianjin the Ming dynasty Dabei Monastery ➚ is a good example, as well as a Grand Mosque ➚; Temple of Confucius and Tianhou Temple. A street has been recreated in the old style: 古文化街 gǔ wén huà jiē ‘Ancient Culture Street’. There is a busy Antique Market on Shenyang Dao every day. More modern architecture can also be seen, Tianjin now has one of the largest Ferris wheels in the World : the Tianjin Eye ➚. The city was of importance back in the times of the Warring States at which time the meandering Yellow River reached the sea near here. Its name means. ‘Guardian of the Celestial sea crossing’ Tianjin further developed in the Sui dynasty when the Grand Canal was extended northwards. With access to the Bohai Gulf; Hai River and the Grand Canal Tianjin is ideally placed for sea and canal transportation. Older parts of the city reflect the centuries of foreign trade. On the northern perimeter of the province the Huangyaguan ➚ section of the Great Wall has been recently restored. The Second Opium War (1858-60) brought British and French forces towards Beijing and they soon overran the Dagukou ➚ (Taku WG) forts along the coast near Tianjin. China signed away further trading rights in the Treaty of Tianjin ➚, but the peace did not last long and Tianjin was subject to more fighting until 1860 when the ‘Convention of Beijing ➚’ gave more rights to foreigners extracted from the weak Qing Emperor Xianfeng who had fled to Mongolia. First British and French ‘concessions’ were built to the south-east of the old walled city and then Japanese; Austro-Hungarians; Belgians; Russians; Italians and Germans got in on the act. Unrest resurfaced again in 1870 when the French Sisters of Mercy were massacred at Tianjin ➚ by Chinese locals who believed that children at the orphanage were being abused, the incident was fueled by the refusal to allow officials to inspect the convent. The concessions were again attacked during the Boxer Rebellion in 1900. Tianjin played a relatively small part in the Civil War and Japanese occupation due in good part to the presence of foreign companies still carrying out trade. Tianjin's place in Communist Party history is partly due to the presence of Zhou Enlai's Marxist study group in the city. In 1976, the city was badly damaged by the nearby devastating Tangshan earthquake. More recently, on 12th September 2015 a large explosion at a storage depot at Binhai led to 173 deaths and 797 non-fatal injuries. An onshore oilfield just south of Tianjin has provided much needed fuel for China. The city's development has been somewhat limited by its proximity to Beijing as companies are unable to act with as much independence as they can at other more remote cities such as Shanghai. Over the centuries the gradual silting up of the Hai river has caused the main port area to move further south to Binhai (formerly known as Tanggu). It has been recently developed as a new, secondary center to rival old Tianjin. 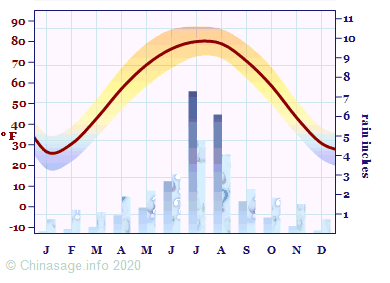 In terms of climate Tianjin has winters cold enough to require ice-breakers to keep the sea channels clear; while in the summer it can be hot and humid. 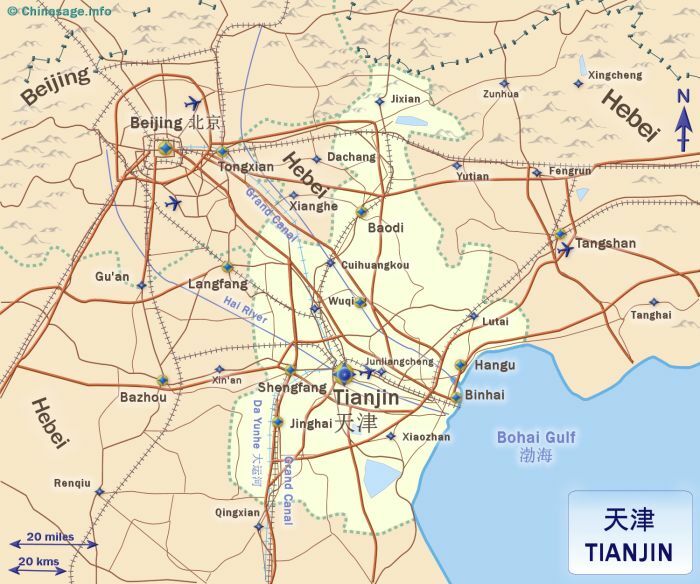 Citation information for this page : Chinasage, 'Tianjin Metropolitan City, China', last updated 3 Dec 2018, Web, http://www.chinasage.info/maps/tianjin.htm.